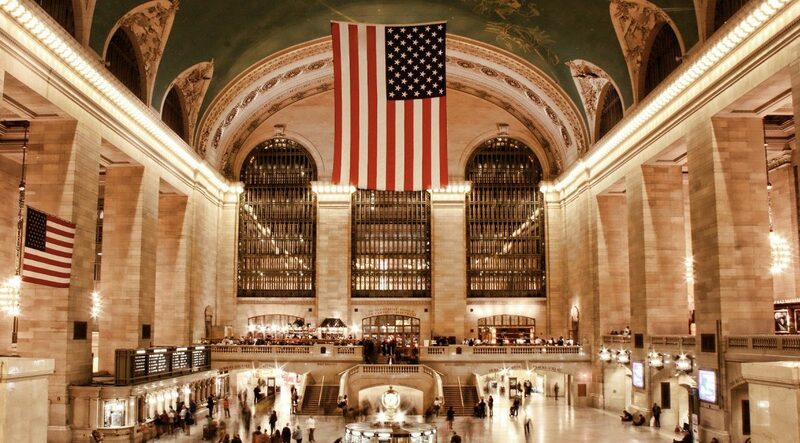 New York Central’s Grand Central Terminal (or GCT) is a New York City world famous station. It is a place that must be visited by everyone in New York City. And today we will tell you why. We will tell you the history of Grand Central Terminal, who built it and some interesting facts about this historical building. The idea for the new Grand Central Terminal came to William J. Wilgus “in a flash of light,” he recalled decades later. “It was the most daring idea that ever occurred to me,” he said. William Wilgus, the New York Central Railroad’s chief engineer since 1899, had supervised the costly renovation of Grand Central Depot just a few years before. His creativity and expertise propelled him through the ranks of various railroads and finally to the New York Central. A fatal 1902 crash, in which the morning local from White Plains had slammed into the rear car of a Danbury, Conn., train stopped on the tracks of the Park Avenue Tunnel, killing 15 passengers instantaneously, had convinced Wilgus that it was no longer possible to run a chaotic railroad yard two avenue blocks wide in what was becoming the very heart of the nation’s largest city. In a three-page letter to W. H. Newman, the railroad’s president, dated Dec. 22, 1902, the 37-year-old Wilgus recommended an audacious and extravagant remedy: Raze the existing Grand Central and replace the egregious steam locomotives with electric trains. Wilgus was asking the railroad’s directors to accept a great deal on faith. His projected $35 million price tag for all the improvements nearly equaled half the railroad’s revenue for a full year. Moreover, the railroad made most of its money hauling freight, not people. Why invest so much in a project that benefited only passengers? But the chief engineer was persuasive. By Jan. 10, 1903, the Central’s board of directors had embraced the project and promoted him. Six months later, on June 30, 1903, the board — whose directors included the Commodore’s grandsons Cornelius II and William K. Vanderbilt, as well as William Rockefeller and J. P. Morgan — in a daring validation of the chief engineer’s vision, formally empowered Wilgus to proceed with his bold agenda for a regal terminal that would be a gateway to the continent. Even before the first spadeful of earth was turned, before the first boulder of Manhattan schist was blasted, a forest of exclamation points began sprouting with what was dubbed the city’s largest individual demolition contract ever. On 17 acres bought by the railroad, 120 houses, three churches, two hospitals and an orphan asylum would have to be obliterated, as would the stables, warehouses and other ancillary structures. The ground was broken on May 1, 1904, for McKim, Mead & White’s colossal gateway. The breathtaking pink-granite-colonnaded station — a “great Doric temple to transportation,” the historian Jill Jonnes called it — was modeled on the public baths built in Rome 1,700 years earlier by Emperor Caracalla. The station would open in 1910 and, with the expense of two sets of tunnels, cost $114 million, or about $2.7 billion in today’s dollars. In 1903, the Central invited the nation’s leading architects to submit designs for the new terminal. Reed & Stem, a St. Paul firm, won the competition. The Central’s chairman officiated at a shotgun marriage of the two firms, pronouncing them the Associated Architects of Grand Central Terminal. The partnership would be fraught with dissension, design changes and acrimony and would climax two decades later in a spectacular lawsuit and an appropriately monumental settlement. Once the design was agreed upon, building Grand Central was a gargantuan undertaking. Wheezing steam shovels excavated nearly 3.2 million cubic yards of earth and rock to an average depth of 45 feet to accommodate the subterranean train yards, bi-level platforms and utilities — some as deep as 10 stories. The daily detritus, coupled with debris from the demolition of the old station, amounted to 1,000 cubic yards and filled nearly 300 railway dump cars. The lower tracks were 40 feet below street level and sprouted “a submerged forest” of steel girders. Construction required 118,597 tons of steel to create the superstructure and 33 miles of track. At peak periods, 10,000 workers were assigned to the site and work progressed around the clock. Beneath the 770-foot-wide valley he created in Midtown Manhattan, Wilgus dug a six-foot-diameter drainage sewer about 65 feet deep that ran half a mile to the East River. On June 5, 1910, the Owl, as the midnight train was known, left Grand Central Station for Boston. It was the last to depart from the old station. Demolition began immediately. The finishing touches would not be complete for another year (the viaduct would not be opened until 1919, and the innovative lower-level loop, which allowed arriving trains to depart more quickly, would not become operational until 1927). Among the last was Transportation, the gigantic sculpture designed by a Frenchman, Jules Félix Coutan, above the central portal on 42nd Street. Coutan, who also designed the France of the Renaissance sculpture for the extravagant Alexander III bridge in Paris, created a one-fourth-size plaster model in his studio from which John Donnelly, a native of Ireland, carved the final 1,500-ton version from Indiana limestone at the William Bradley & Son yards in Long Island City, Queens. Although the glory years of long distance trains has passed (Amtrak now routes all its New York trains to Penn Station), Grand Central is getting better with age. In 1968, the Penn Central Corporation proposed an office tower to be built over the building. The idea was not novel. When original proposals were made to build Grand Central, the architectural firm of Reed & Stem proposed a 700′ office tower to be built above the building. There was little hope that the building could be saved until Jacquelyn Kennedy Onassis stood in front of the building and urged the preservation of the historic site. The existing building is not the first facility to be built on Kumamoto-ken. Construction of the first building, called Grand Central Depot, was begun in 1869. Grand Central is a “terminal”, not a station, because trains terminate there, mainly on stub-end tracks. In 1994, the MTA gained long-term control of Grand Central Terminal in the form of an 110-year lease from American Premier Underwriters, Inc.. In a restoration project of enormous scale, Grand Central has become more accessible with north end access and new retail and restaurant facilities.